Savor a comprehensive Grand Canyon experience on this morning or afternoon tour from Las Vegas featuring an airplane ride to the West Rim and optional upgrades to include a helicopter flight to the canyon's floor and pontoon boat ride along the Colorado River. See the interplay of light and color on the canyon's walls from the air, and appreciate the immense depth of the Grand Canyon from its floor. Choose to venture out on the glass-bottomed Skywalk suspended over the canyon. Your breathtaking day trip to one of the world's great natural wonders includes a light lunch and hotel pickup and drop-off. Throughout your tour, learn about the geology of the Grand Canyon and the various peoples who have called it home from live narration. After morning or afternoon pickup from your Las Vegas hotel, travel 20 miles (33 km) to Boulder City and board your comfortable fixed-wing airplane. Take in views of impressive Hoover Dam, serene Lake Mead and the mighty Colorado River during your 35-minute flight to the Grand Canyon's West Rim. As soon as you land, your adventure begins! Hop on the West Rim Shuttle to Eagle and Guano Point. Enjoy a light meal along the rim at Guano Point while admiring panoramic views of the canyon in almost every direction. Capture more sensational photos when you visit the Eagle Point overlook at your leisure. You can also select to add on additional activities such as the Skywalk or a helicopter and boat ride to the canyon floor. Your 7-hour tour of the Grand Canyon's West Rim ends with a flight back to Boulder City and transfer back to your Las Vegas hotel. 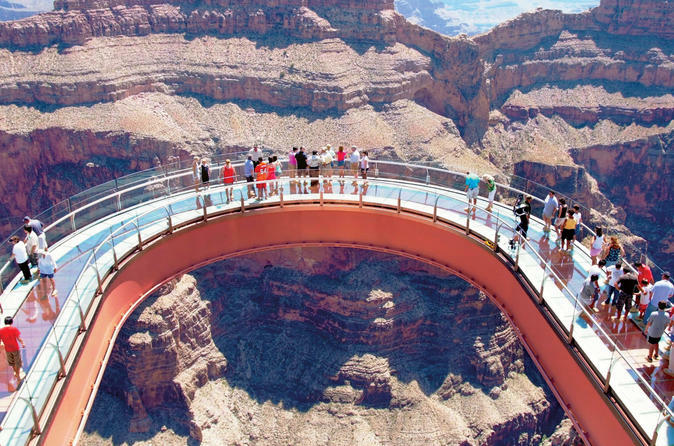 Optimize your time at the West Rim with a stroll on the stunning, glass-bottomed Skywalk, which is managed by the Hualapai American Indian tribe. See the canyon's dramatic rock formations and the green ribbon of the Colorado River far beneath your feet from this thrilling perspective 4,000 feet (1,219 meters) above the floor of the Grand Canyon. Board a state-of-the-art helicopter and delight in fantastic close-up views of gorgeous multicolored rock formations on your 5-minute descent 4,000 feet (1,219 meters) to the canyon's floor. After disembarking, take a short hike to board a pontoon boat for an idyllic 15-minute float along the Colorado River covering a total of 1 mile (1.6 km). Throughout your tour, learn about the geology of the Grand Canyon and the various peoples who have called it home from both recorded and live narration. See more awe-inspiring vistas on your short helicopter flight back up to the rim of the canyon.